Rh blood group system is the most complex and immunogenetic blood group system. Prevalent RHD alleles vary in different populations. We conducted the present study to examine the genotype of DEL individuals and to elucidate whether novel alleles exist in the Chinese population. DEL phenotype was identified by a serologic adsorption-elution method. The nucleotide sequences of ten RHD exons and exon-intron boundary regions were evaluated by RHD gene-specific PCR-SSP and sequencing. Of 42306 samples from individual donors and patients, 165 samples were typed as D-negative. Among these D-negative samples, 41 DEL individuals were observed. Thirty-seven DELs were confirmed to have the RHD1227A allele. Two DELs seemed to have RHD-CE-D hybrid alleles, including one RHD-CE (4–7)-D and one RHD-CE (2–5)-D. Two novel RHD alleles were found among the rest of the DEL samples, including one RHD93T > A and one RHD838G > A. In this study, about 24.85% (41/165) of the apparent D-negative Chinese individuals were DEL. RHD1227G > A is the most frequent allele in Chinese DEL phenotypes, accounting for 90.24% (37/41). The RHD-CE-D hybrid allele might be the second most frequent DEL allele in the Chinese population. Our study would contribute to the understanding of the molecular mechanism underlying D antigen expression of DEL individuals and provide useful information for designing suitable genotyping strategies in RhD-negative individuals in Asia. The Rh blood group system is the most complex and immunogenetic blood group system. The Rh antigens are encoded by a pair of homologous genes, RHD and RHCE, which are located on chromosome 1p34.3-36.1. The two genes have opposite orientations at the RH locus, each gene has 10 exons and their sequences are highly homologous. RHD encodes the D polypeptide, while RHCE gives rise to the C/c and E/e polymorphisms. The RHD gene is flanked by an upstream Rh box (at its 5′ end) and a downstream Rh box (at its 3′ end). Both Rh boxes have a length of ≈ 9000 bp in identical orientation and share 98.6% homology. The region (breakpoint region) in which the RHD deletion occurs is located within a stretch of 1463 bp in which both Rh boxes have an identical sequence (identity region). The hybrid Rh box, only present when the RHD gene is deleted via the proposed mechanism of unequal crossing over, contains a sequence identical to that of the upstream Rh box in the 5′ part preceding the identity region, and the 3′ part following the identity region is identical to the downstream Rh box sequence in European people . Studies of the blood group system have shown that racial differences exist not only in the genetic background of the RHD gene but also in the frequencies of the RHD allele [2–5]. About 15% of European people are D-negative phenotype and are mostly associated with the deletion of RHD between the upstream and the downstream Rhesus boxes. Interestingly, several studies, however, have revealed that there has been the presence of the RHD gene in the majority of D-negative Africans and about a quarter of D-negative Africans have an inactive RHD gene of pseudogene (RHDψ) with a 37 base pair (bp) insertion and a nonsense mutation . In the Asian population, RHDψ is rare, and a certain percentage of RhD-negative individuals have RHD-CE-DS hybrid gene or RHD1227A allele. In contrast to the European population, the RhD-negative blood type only occurs in 0.3-0.5% of the Chinese population;  however, nearly 30% of the RhD-negative individuals belong to the DEL phenotype, which is a rare variant of the Rh system with a grossly intact RHD gene, of which one is the 1227G > A mutation that probably disrupts normal intron splicing. In the European population, the frequency of DEL phenotype was 1:3030 and that of RHD1227A allele was 1:9091 . DEL phenotypes derive from several mechanisms. Previous studies showed that DEL phenotype was associated with either a long deletion of RHD gene from intron 8 to intron 9, including whole exon 9, or a missense mutation (RHD1227G > A) in exon 9, or splice-site mutation, including RHD (IVS3 + 1G > A), or a frameshift mutation, including RHD (X418 L) or a mutation in the coding region, or premature stop codons [8–13]. Those studies indicate the D-negative trait may be generated by multiple molecular mechanisms. DEL is the most frequent D variant phenotype in the RhD-negative Chinese population that is confirmed by the adsorption-elute test. Moreover, previous studies through genomic DNA analysis showed that the RHD1227 allele is the prevalent causal mutation for DEL individuals in China. Those individuals possess one or two of these alleles with Ccee or CCee phenotypes. Whether there are other DEL alleles in the Chinese population is not yet resolved. The aim of this study was therefore to collect large numbers of blood samples to explore the molecular basis of DEL in the Chinese population. EDTA-anticoagulated peripheral blood samples were collected from outpatients, inpatient and blood donors at the Anhui Provincial Hospital, the Affiliated Hospital of Anhui Medical University, the Clinical College of Nanjing Medical University, the Affiliated Hospital of Gulin Medical College, the Shaoxing People’s Hospital of Zhejiang Province, the 4th Affiliated Hospital of Jiangsu University, Blood Center of Anhui Province, Shenzhen Blood Center of Guangdong Province and Wuxi Blood Center of Jiangsu Province in the southeast China. This study was approved by the institutional Ethics Review Board of Nanjing Medical University and all subjects provided written informed consent to their participation in it. Rh blood type phenotype D status was determined by a microplate technique with IgM monoclonal anti-D reagent (Immucor, Norcross, GA; Gamma Biologicals, Houston, TX) . Subsequently, the Rh C/c and E/e antigens were determined by using agglutinating monoclonal anti-C (Novaclone, Dominion Biologicals, Dartmouth, Canada), anti-E (Gamma Biologicals), anti-c (Immucor) and anti-e reagents (Immucor). All samples that were negative with anti-D in the direct agglutination were retested by using the indirect anti-human globulin test (IAT). The indirect anti-human globulin test was used to detect weak D or partial D phenotype. Furthermore, samples typed as D-negative by the IAT were retested for the DEL phenotype through an adsorption-elution test in tubes. If the result was positive (≥1+), the sample was determined to belong to the DEL phenotype. If the result was negative, the sample was determined to be truly RhD-negative phenotype. Genomic DNA of DEL samples was prepared using QIAamp DNA Blood Mini Kit according to the manufacturer's recommendations (Qiagen, Valencia, CA, USA). The column-bound circulatory DNA was eluted in distilled water and quantified by using a spectrophotometer (NanoDrop 2000c, Thermo Scientific, Wilmington, DE, USA). Primers for RHD exons 1 to 10 were given in Table 1. β-actin gene was used as an internal control. Amplification was carried out in a thermal cycler (Veriti 96, Applied Biosystems, Foster City, CA). Cycling conditions for RHD exon 1 and 10 were denatured at 95°C for 5 min, then 40 cycles of 30s at 94°C, annealing time was 40 seconds at 64°C (exon 2–4, 6, 8), 62°C (exon 1, 7, 9, 10, RHD1227A) and 60°C (exon 5), and extension for 1 min at 72°C. The final extension was at 72°C for 10 minutes. PCR products were visualized by electrophoresis on a 1.5% agarose gel with ethidium bromide staining and these were photographed under UV light. *s = sense primer; a = antisense primer. seq = sequencing primer. #The positions of the synthetic oligonucleotides are indicated relative to their distances from the first nucleotide position of the start codon ATG for all primers in the promoter and in the exons or relative to their adjacent exon-intron boundaries for all other primers. The PCR amplification was performed by using the expand high-fidelity PCR system with primers rez7 (consensus, 5′ of the Rh box identity region) and rnb31 (specific for downstream of the Rh box, 3′ of the Rh box identity region) . PCR products were digested with PstI at 37°C for 3 h, and the fragments were resolved by electrophoresis on a 1.5% agarose gel with ethidium bromide staining and these were photographed under UV light. Amplified DNA products were purified using an isolation kit (NucleoSpin Extract II, Macherey-Nagel, Düren, Germany) and sequenced on a genetic analyzer by DNA technology (ABI 3130 XL, Applied Biosystems, Aarhus, Denmark). The complete RHD exons 1 to 10 including adjacent intron regions were sequenced from PCR products with cycle-sequencing kits (BigDye-terminators v.1.1; Applied Biosystems, Weiterstadt, Germany) and Sequence determination of amplicons was performed on both strands using the respective PCR primers with an ABI PRISM 3730 automated sequencer (Applied Biosystems, Foster City, USA). The nucleotide and deduced amino acid sequences were analyzed and compared with the published sequences using computer software (Lasergene 99, DNASTAR, Madison, WI) as a sequencing analysis tool. All sequenced PCR products were compared with GenBank Accession Number BN000065. A total of 165 apparent D-negative samples were found among the 42306 blood donors and patients through the microplate determination. When the D-negative samples were retested by the IAT and the adsorption-elution test, a total of 41 DELs were found among these samples. In the Chinese population examined, approximately 24.58% (41/165) of the apparent D-negative individuals belong to DEL phenotypes (Table 2). *Presence (+) or absence (–) of the RHD gene. Among the 41 DELs samples, a total of 37 samples were determined to have the RHD1227A allele by PCR-SSP analysis and sequencing (Table 2, Figures 1a and 2a), accounting for 90.24% (37/41) in the Chinese DEL individuals. All of these individuals carrying RHD1227A allele were demonstrated that the mutation is located in the splice site at the exon 9 and intron 9 junctions. The remaining four DEL samples did not have RHD1227A (Figure 1a; lines 6 to 9). Two samples seemed to have RHD-CE-D hybrid alleles. According to the PCR-SSP for the RHD gene exons 1 to 10 determination, the first sample (sample No: 13039) lacked RHD exons 4 to7, the second sample (sample No: 13038) lacked exons 2 to 5 (Figure 1b and c). The two samples were confirmed to be RHD-CE (4–7)-D and RHD-CE (2–5)-D, respectively. No mutation was found in the RHD-specific exons by sequencing. Results of the PCR-SSP analysis. In all lanes, a 473-bp product was amplified as the internal positive control; M, molecular marker (2000, 1000, 750, 500, 250 and 100 bp, respectively). (a) PCR-SSP for RHD1227A allele in 9 DEL samples. Lanes 1 to 9 showed the PCR-SSP results of 9 DEL samples. Lanes 1 to 5 showed that the RHD1227A specific amplifications (band of 109 bp) were positive (Sample No.13001-13005). They were shown as representatives of 37 DEL individuals carrying RHD1227A allele. Lane 6 to 9 showed that the RHD1227A specific amplifications were negative (Sample No.13038-13041). (b) PCR-SSP for RHD-CE (4–7)-D in one DEL sample (Sample No.13039). Lanes 1 to 10 showed the PCR-SSP results of the RHD exons 1 to 10; Lanes 4 to 7 showed that the RHD specific amplifications were negative for exons 4 to 7; RHD specific amplifications were positive for exons 1 to 3 and 8 to 10. (c) PCR-SSP for RHD-CE (2–5)-D in one DEL sample (Sample No.13038); lanes 1 to 10 showed the PCR-SSP results of the RHD exons 1 to 10; Lanes 2 to 5 showed that the RHD specific amplifications were negative for exons 2 to 5; RHD specific amplifications were positive for exons 1, 6 to 10. Electropherograms of RHD DNA sequencing. 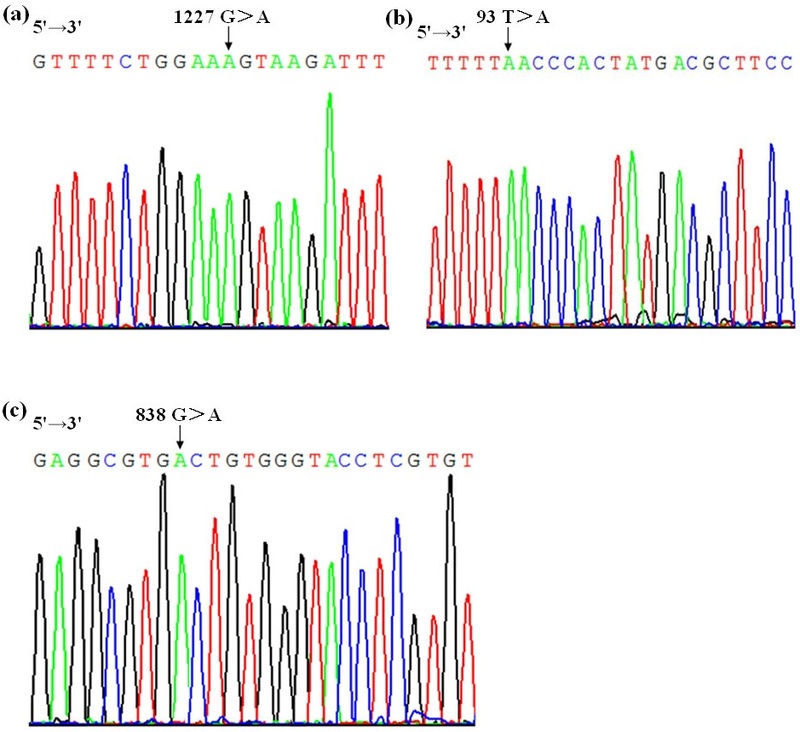 (a) Sequencing analysis of the RHD1227A allele. The arrow indicates the position of nucleotide mutation between RHD exon 9 and intron 9. A representative example of 37 RHD1227A genotyped cases is shown; (b) Sequencing analysis of the RHD93T > A allele in one DEL sample (Sample No.13040). The arrow indicates the position of nucleotide mutation in RHD exon 1; (c) Sequencing analysis of the RHD838G > A allele in one DEL sample (Sample No.13041). The arrow indicates the position of nucleotide mutation in RHD exon 6. Two novel RHD alleles were found in the remaining two DEL samples. One sample (sample No: 13040) was found to have a RHD93T > A mutation (Figure 2b), the other sample (sample No: 13041) had a RHD838G > A mutation (Figure 2c). Their DNA sequences were deposited under GenBank accession numbers: RHD93T > A (KJ558352 for exon 1), RHD838G > A (KJ558353 for exon 6). The RHD93T > A and RHD838G > A alleles were missense mutations, which caused F31L and A280T amino acid mutations, respectively, both of the two mutations occurred in the RhD transmembrane domain. The samples with RHD93T > A and RHD838G > A alleles belong to Ccee phenotype. The sample assigned to RHD93T > A allele was found to be RHD+/RHD + homozygote by PCR-RFLP analysis and the other sample with RHD838G > A allele was RHD+/RHD– heterozygote (Table 2). DEL phenotype was determined on the basis of non-agglutination by the IAT procedure and positive result by an adsorption-elution technique. Molecular studies have shown that a heterogeneous array of variant RHD allele can result in the DEL phenotype . Körmöczi and colleagues suggested that the DEL phenotypes might be subdivided into two groups, partial DEL with characteristic D epitope loss caused by either RHD-CE-D hybrid genes or RHD point mutation such as carrier of RHD (IVS3 + 1G > A) affecting extracellular RhD loops and complete DEL where the majority of D epitopes are conserved such as RHD1227A . According to the published data [9, 17] and our results, the RHD1227A allele was the most frequent allele in the Chinese DEL individuals. In our study, two DELs seemed to have RHD-CE-D hybrid alleles, including one RHD-CE (4–7)-D and one RHD-CE (2–5)-D. The RHD-CE (4–7)-D was thought to be a DEL allele by our laboratory, while a similar hybrid RHD-CE (4–7)-D was described as D-negative . Whether there were miniscule differences between these two alleles has not yet been clarified. The RHD-CE (2–5)-D was similar to the RH allele that is also called DVI type 4. Hasekura et al. have suggested that some DELs were caused by a trans effect of C on a haplotype containing a weak D allele . Whether the DVI-like DEL has a similar mechanism, that the DEL was resulted from the influence of C in trans on a haplotype with a partial D allele, needs to be further analysed. The hybrid gene individuals were detected with Rh box zygosity. They were found to be RHD+/RHD– heterozygote (Table 2). These results may also be in concordance with the studies of Li et al . Two samples with the novel RHD93T > A and RHD838G > A alleles showed slightly stronger positive results (2+) than other DEL samples (1+) in the adsorption-elution test. This phenomenon suggested that there might be scant differences in the D antigen between these two samples and other DELs. The possibility that these two samples might be two new kinds of weak DS could not be excluded. DEL is the weakest D positive phenotype, whether the potential danger that DEL RBCs might cause a clinical transfusion reaction cannot be completely excluded. Recipients with a truly D-negative phenotype developed anti-D after transfusion with DEL RBCs [19, 20]. Recently, Richard and his colleagues found a patient with a DEL phenotype who developed anti-D [11, 12]. Other members of our team have not yet reported analogous cases in the Chinese population. Shao and his colleagues found that the Asian type DEL displays the complete repertoire of RhD antigen epitopes. They suggested that people in East Asia who carry the DEL variants could safely receive blood transfusion from RhD-positive donors . Our previous study also supported the biochemical observations that DEL variants express normal RhD and pose virtually no risk of inducing anti-D antibodies . We also confirmed that this is an exact model test that people carrying the DEL variants can safely receive blood transfusion from RhD-positive donors. Throughout the world, the majority of DEL phenotypes are misinterpreted as D-negative owing to the limits of routine typing. For this reason, the recipient with a truly D-negative phenotype would be likely to develop into anti-D alloimmunization after transfusion with DEL RBCs. So it would be of interest to routinely screen serologically D-negative donors for the presence of the RHD gene in order to discriminate all clinically relevant RHD DEL alleles. An optimized PCR strategy that checks for RHD-specific polymorphism, supplemented by the specific detection of aberrant alleles, would be a good choice. Samples carrying RHD deletion should be correctly typed by multiple PCR utilized for RHD genotyping. Testing additional RHD exons would improve the specificity of RhD prediction. Although direct sequencing is currently the gold standard in mutation identification, it is still relatively laborious and expensive, whereas PCR-SSP as a one-step method is less expensive and less time consuming. In any case, the combined use of serologic and molecular D typing techniques may reduce the number of such transfusion incidents. All of these findings suggested that it might be important to explore the molecular basis of DEL individuals in Asia and to form molecular screening techniques to determine the DEL phenotype accurately. In this study, about 24.85% (41/165) of the apparent D-negative Chinese individuals were DEL. RHD1227G > A is the most frequent allele in Chinese DEL phenotypes, accounting for 90.24% (37/41). The RHD-CE-D hybrid allele might be the second most frequent DEL allele in the Chinese population. Novel DEL alleles are still relatively rare and frequencies of occurrence are also very low. Our study would contribute to the understanding of the molecular mechanism underlying D antigen expression of DEL individuals and provide useful information for designing suitable genotyping and transfusion strategies for the RhD-negative individuals in Asia. This work was supported by the Medical Research Foundation of Wuxi Municipal Health Bureau (Grant No. ML201203) and the Scientific Technology Development Foundation of Nanjing Medical University (Grant No. 2012NJMU071). The funders had no role in the study design, data collection or analysis, decision to publish, or preparation of the manuscript. Authors who obtained funding included XDW and JG; Authors who participated in conception and design were XDW, JG and CPS; Authors who carried out data analysis and interpretation included JG, AYS, JW, ZLP and LHH; Authors who drafted and finalized the manuscript were XDW, JG, and CPS. All authors read and approved the final manuscript.